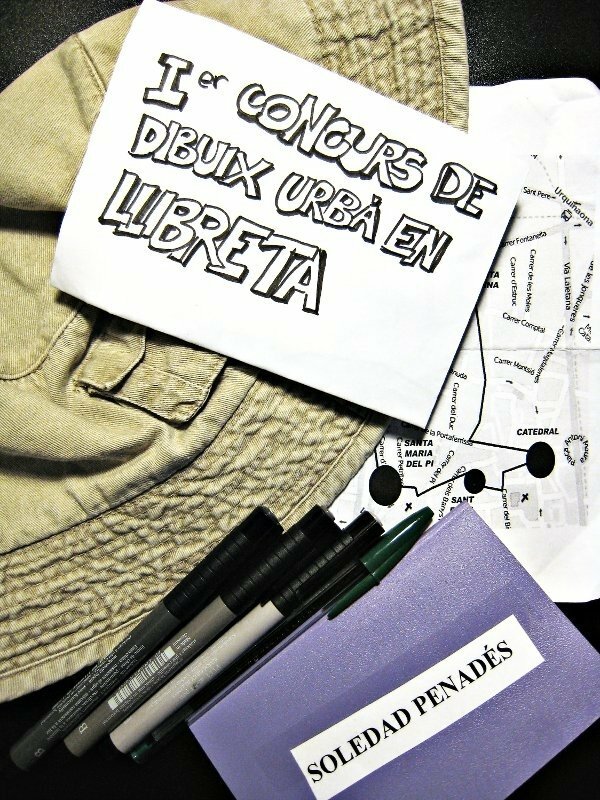 Read my "Ier concurs de dibuix urbà" sketchbook online. When I heard about a urban sketching competition taking place in Barcelona, I signed up immediately! This is the result of an entire day wandering around Barcelona's Gòtic quarter (OK, actually not all day, but more like from 12h to 19h), gazing intently at places I had already seen before, and examining the unknown ones with a sheer load of curiosity. Also--taking care to avoid being pickpocketed, as the organisers had gone to great lengths to warn us (!!). The sponsors provided us with a small Moleskine journal and a green BIC ballpen. It was years since I last used a ballpen this colour, and even if I had brought three Faber Castell pens in shades of grey, I decided to use the ballpen too, to add some colour highlights here and there. I think this worked out quite nicely, although I've always had a penchant for green BIC ballpens, so maybe I'm not being too objective here (when in school, I thought they were a nice escape from the scholarly blue/red/black ballpen uniformity, although it enervated teachers when I submitted exams written in green ink, haha!). draw at least five specific places: Plaça Catalunya, Santa Anna's Church, Barcelona's Cathedral, Sant Felip Neri's church, and Santa Maria del Pi church. At the end of the day we submitted our sketchbook and waited a week for the jury to choose a winner. After that, winners would be announced and we could recover our sketchbooks. I didn't win anything, but I had lots of fun, made some cool drawings, and discovered interesting places, so what's not to like?